No Englishman will compete in the last eight of the British Open for the first time since 1992 after Yorkshire’s James Willstrop was yesterday knocked out in the second round by top seed and world No 1 Mohamed Elshorbagy yesterday. A former world No 1 himself, Willstrop, from Pontefract, lost out 11-6, 11-6, 8-11, 11-5 after just over an hour on court at the Airco Arena in Hull. 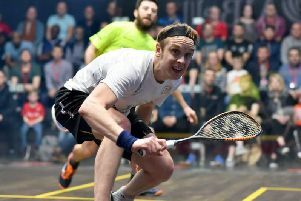 The result saw Egypt’s Elshorbagy avenge his third round loss to 32-year-old Willstrop in last year’s world championships in Seattle, although the Yorkshireman was happy with his performance. “I’m pleased to play that way,” said Willstrop, currently ranked 13th in the world. “I didn’t set anything on fire in the first two games and could have been better. He played well and he’s been thinking about this match for a long time, since Seattle. He was out to do something different from then. “I have to keep building on it and hopefully keep upping my level. Obviously I want to win, but it’s all positive for me. As for the world No 1, he was happy to have progressed against such a tough oppnent. “I’ve been waiting for this match for four months, since the World Championship,” said Elshorbagy. “After he got back from his injury, the first time I saw him return to his best was against me in the World Championship. “I was really happy to see him playing that well, it’s important for the game to have someone like him to be playing very well. “I was focused from the first point today, I thought we played such a high-quality match for a second round match. Elsewhere, defending women’s champion Camille Serme remained on course to retain her title after a masterful performance against England’s Victoria Lust sent her through to the last eight. The fifth seed put Lust to the sword in a comprehensive 11-5, 11-8, 11-3 victory to seal her spot in the next round - where she will face women’s world No 1 Laura Massaro, the only English player left in the competition, in a repeat of last year’s final. Massaro came through a difficult tie against Denmark’s Line Hansen to continue her attempts to lift a second British Open crown.